If, as most legal observers seem to expect, the Supreme Court in June overturns the most important provisions of the Patient Protection and Affordable Care Act, it will be a major setback for President Barack Obama at a crucial time in his re-election campaign. No matter how some overly optimistic commentators try to spin it otherwise, losing the signature legislative achievement of what Obama hopes will be only his first term would be a huge defeat both for his policies and for his image. It would raise troubling questions about Obama's approach to governing, especially during his first two years in office, when he seemed to place so much value on trying to reach bipartisan compromises with his Republican opponents that his liberal supporters felt he was turning his back on them. He was so eager to find common ground with the GOP that he gave up his own ideas and adopted theirs instead. That was really dumb. 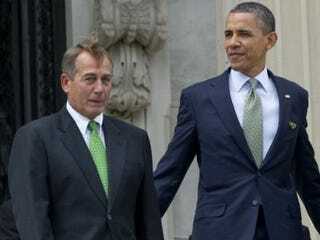 Obama's relentless pursuit of agreement with increasingly partisan conservative Republicans produced inferior policies. On top of that, Republicans have proved that they simply cannot be trusted to participate in building a consensus, even if it is based on their own ideas. The notion of "loyal opposition," so essential to the success of a democratic system, is anathema to Obama's enemies. As the battle for his second term heats up, Obama has become more aggressive. He seems finally to have learned that there is just no dealing with these people. It was a costly lesson. For Republicans, defeating him at every turn was the highest priority, far more important than offering realistic solutions to the plethora of catastrophic problems that he inherited from the previous administration. Radio blabbermouth Rush Limbaugh repeatedly declared his "hope that Obama fails." Senate Republican leader Mitch McConnell vowed that "the single most important thing we want to achieve is for President Obama to be a one-term president." Yet Obama, in ways that now seem naive, tried his best to find common ground. There is no clearer example of this than his evolving position on health care. Obama started out as a critic of an individual mandate forcing everybody to buy health insurance. Instead he outlined a universal health care plan that would have given everyone access to coverage similar to what Congress receives, with subsidies for those in lower-income brackets. He also would have created a national health care insurance exchange as an option for those who wanted private health insurance. The idea was to make obtaining a policy so attractive that there would be no need to force people to buy one. But within a few months after being sworn in, Obama realized that his ambitious plan had no chance of overcoming opposition from Republicans and conservative Democrats. So in a flip-flop worthy of Mitt Romney, his likely opponent this fall, he became a convert to the mandate. Forcing healthy young people to buy insurance was essential to making the system work. Once the notion of a mandatory, government-controlled single-payer system similar to Medicare was abandoned, the mandate was the only way to extend private health insurance coverage to those with pre-existing conditions without driving costs through the roof. Mind you, the mandate was originally a Republican Big Idea, cooked up by conservative policy wonks at places like the Heritage Foundation as a free market alternative to the proposal put forth by then-first lady Hillary Clinton. It had big-time Republican support. Obama's calculation appeared to be that he could co-opt some GOP lawmakers into supporting the bill by adopting a Republican approach. That would have been a reasonable strategy if Obama had been dealing with reasonable opponents. After all, in 1993 Republicans twice introduced health care reform proposals based on the mandate that were backed by such stalwart conservatives as Sens. Orrin Hatch of Utah, Charles Grassley of Iowa and Christopher Bond of Missouri. A bipartisan bill containing the idea was put forth in 2007. A year earlier, Romney, then governor of Massachusetts, had signed into law a bill requiring nearly everyone in the state to obtain health insurance or pay a penalty. It was a model for Obama's new approach. But that was all before the Republicans succumbed to the "If Obama's for it, we're against it" philosophy that has made the president's attempts to bargain with them such a frustrating exercise in futility. Instead of giving Obama credit for adopting their approach, Republicans started using it to beat him over the head. All of a sudden the individual mandate went from being a free-enterprise approach to making health care coverage universal to an intolerable assault on American liberty. The folks at the Heritage Foundation who had thought up the idea now decided that it was unconstitutional. Tea Party partisans — some carrying firearms — invaded congressional town hall meetings to inveigh against the supposed threat of nonexistent "death panels" that right-wing politicians like Sarah Palin claimed would cut off care for the elderly and disabled if Obama's plan became law. When Obama's plan finally passed in 2010 after an interminable legislative battle, it did not get a single Republican vote in either the House or the Senate. I, like many liberal Democrats, wanted Obama to fight for such a single-payer system. I even wrote a piece for The Root accusing him of "punking out" to "a political axis of evil comprised of insurance and drug lobbyists, right-leaning, so-called moderate Democrats, and wild-eyed conservative Republicans" by abandoning what was then known as "the public option." Obama's diehard supporters contend that, given the circumstances, the law that was passed was the best Obama could do. And indeed, it does contain many laudable provisions, such as allowing young adults to remain on their parents' policies until age 26, and forbidding private insurers from denying coverage to people with pre-existing conditions. But many health care experts believe that whatever its virtues may be, Obamacare is a mishmash, sadly inferior to a single-payer system of health care reform. The virtues of a single-payer system in holding down costs and making high-quality care widely available have been amply demonstrated by the success of Medicare and Veterans Affairs. This week Obama declared, "I'm confident that the Supreme Court will not take what would be an unprecedented, extraordinary step of overturning a law that was passed by a strong majority of a democratically elected Congress." I hope he's right, for the sake of his presidency and for his reputation as a constitutional lawyer. But if he's wrong and the law is overturned, it will mean that he blew his first term fighting for a badly flawed substitute for the historic overhaul of the health care system that he campaigned for — and for which he couldn't get even a shred of Republican support. It would be proof, as if more proof were needed, of how silly it is to seek compromise with those whose only aim is to destroy you. Jack White keeps an eye on right-wing politics for The Root.